One of our top priorities is to offer conveniently located venues to our customers, and our hope is that these new course offerings will meet that goal. Project Management Academy® (PMA) recently announced the expansion of its 4-day PMP Boot Camp to four new locations: San Mateo, CA; Kirkland, WA; north Denver, CO; and downtown Atlanta, GA. PMA provides public courses in over 50 cities around the United States, in addition to hosting on-site corporate trainings across the nation. The PMP boot camps offered by PMA follow a 4-day schedule and are led by highly experienced project management educators. Additional materials included with the program are PMA's Exam Strategy Guide®, written and electronic study aids, access to PMA's virtual library for online training, a copy of the Project Management Body of Knowledge®, 5th edition, more than 1,400 practice exam questions, free post-class tutoring, and a money-back pass guarantee. Project Management Academy® is the most trusted name in project management training, providing PMP, Agile, Six Sigma and PDU courses nationwide. 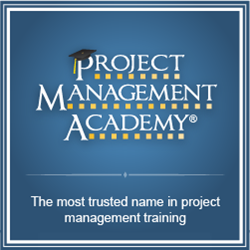 Project Management Academy is a Registered Education Provider with the Project Management Institute®.